A Memorandum of Understanding has been signed with the Ministry of Law and Human Rights in Indonesia for active TB case-finding through annual screening and diagnosis in correctional facilities in five provinces. KNCV Tuberculosis Foundation and FHI360 have signed the agreement on behalf of Challenge TB with the Ministry of Law and Human Rights in order to combat tuberculosis (TB) and TB/HIV in Indonesia’s correctional facilities through active tuberculosis case-finding. TB and HIV/AIDS were among the top ten causes of mortality and morbidity in prisons and detention centers in Indonesia in 2014. While the prison and pre-trial detention populations are relatively small, they constitute an important vulnerable group. The overcrowded situation (by 55%) and the inadequate administrative or management measures against TB infection control in the prisons contribute to the high TB burden in Indonesian prison settings. The Memorandum of Understanding between the Directorate General of Corrections of the Ministry of Law and Human Rights and Challenge TB was signed in April 2016, in the presence of Yasonna H. Laoly (Minister of Law and Human Rights). Under this agreement, annual TB screening will be provided for all inmates and prison staff in 30 prisons and detention centers in five provinces where the Challenge TB project is active. X-Ray and TB symptoms will be used as screening tools, while Xpert/MTB Rif examination will serve as diagnostic tool. To date, workshops with stakeholders have been held to disseminate information and prepare the program in seven districts in five provinces: North Sumatra, East Java, Central Java, West Java and Jakarta. The TB screening is currently taking place in Jember prison, East Java and for the others will start in the coming months. The correctional facilities will treat the patients with TB, multidrug-resistant TB (MDR-TB) and TB/HIV, with the support of Puskesmas (Primary Health Centers), District Health Offices and referral health facilities for MDR-TB and TB/HIV. The Directorate General of Corrections will use the results of the screening to improve its policy on active case-finding of TB in correctional facilities. Photograph by Trishanty Rondonuwu. 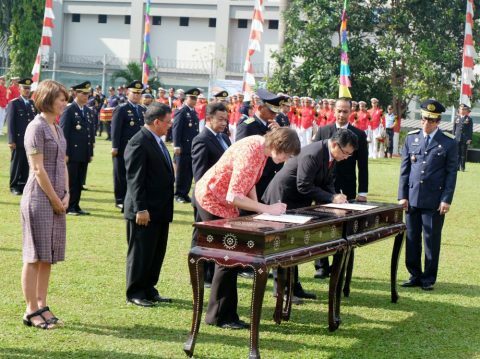 Signing of the Memorandum of Understanding by Agnes Gebhard (Challenge TB’s Chief of Party/ Country Director of KNCV), Caroline Francis (Country Director of FHI360), and I. Wayan K. Dusak (Director General of Corrections, Ministry of Law and Human Rights).